What do you get for the guy who has everything? Well, if money is no object, you wouldn’t go far wrong picking out one of the new Hatch Reels custom jobs, with engraved-and-painted artwork by Lance Boen. 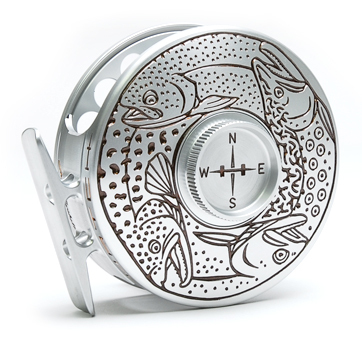 As you can see, the interlocking fish designs are substantially different than the fish artwork offered by other companies, which typically has been painted into the anodization rather than etched onto the surface of the reel. Of course, craftsmanship like this doesn’t come cheap. The reels are available in Big Game Bluewater (12 Plus – $2625), Into the Flats (7 plus and 9 Plus – $1800-2250), Chasing Dorado (9 plus – $2250), Steelhead Lifecycle (7 Plus and 9 Plus – $1800-2250), Waters Bounty (3 Plus – $1200), and Trout Compass (5 Plus – $1500, pictured). Each reel comes with a saddle-leather case and a “wine box” made of wood, for display. What’s your favorite Custom Hatch design? Let us know in the Comments section!